If you're coming home late night to Marikina or passing through, there are couple of places you can have a late meal, a quick midnight snack, or take home food. Aside from the usual convenience stores, there are a few 24 hour fastfood joints. 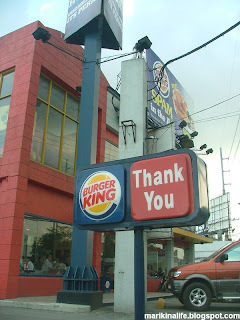 If you're coming from Quezon City or Pasig City and cruising along Marcos Highway, you can get a quick bite at Burger King. Contrary to popular belief, this branch is not located in Cainta or Antipolo. It's just at the very outskirt of Marikina City. Aside from the standard menu of Burger King, this branch also serves breakfast meals as early as 12 midnight. They also serve a huge cup of coffee when you order their BK Joe coffee. They have a drive-thru road for those who wish to take out their food. What's unique about this branch of Burger King is that there is an internet cafe on the 2nd floor, which is also open 24 hours. A lot of people spend the wee hours of the morning here equipped with their laptops enjoying the free wifi when you order. When you take the immediate u-turn after Burger King, you'll instantly see McDonalds to your right. McDonalds is also 24 hours open and has a drive thru for convenience. Unlike Burger King, they only start serving breakfast at 6am. Their standard menu though is available any time of the day. What's convenient about this branch is that just outside is a taxi stand where taxis as always available during the night and early morning. If you're not too keen on fastfood, you can turn right to Gil Fernando Ave and not far is the famous Tapsi Ni Vivian. Here, you can dine and select from a vast menu. Their specials, bulalo and tapsi are always available. If you're the type who would like your meal served on a plate instead of a styrofoam container or wrapped in plastic, then this is the place for you.